Michael Chabon has been a favourite writer of mine ever since I devoured his Pulitzer-winning novel The Amazing Adventures of Kavalier & Clay in the space of a few sleepless San Francisco nights in 2009. So last week I jumped at the chance to see Chabon read from his new book, Telegraph Avenue, at Barnes & Noble Union Square. Similar to Zadie Smith but with an even bigger, more excited crowd, Chabon read at length from the very beginning of the book. Chabon is one of America’s most beloved working writers and it’s easy to see why – he has an easy charisma and manages not to seem pretentious even when he’s speaking about quite high concept ideas and with complex language. I think it is his love of language that allows him to do this – as Chabon read he seemed to taste the words, rolling them around his mouth and savouring them on his tongue, like a chef approving his selections of specific flavours and textures. Telegraph Avenue opens with two anonymous young characters, a white boy on a skateboard and black boy on a fixie, to set the scene of the Berkeley neighbourhood the novel luxuriates in. We meet the two main characters, overgrown manchildren mad for music, running the rare vinyl record store Brokeland, which soon faces annihilation at the hands of a monster chain store headed to gentrify the neighbourhood. From the first taste I can’t wait to read this book, although my budget sees me waiting for a copy behind 183 other Brooklyn Public Library members, so I just hope I get to it this year! Telegraph Avenue seems to weave together themes of growing up and gentrification and fatherhood and holding onto the past – be it an old soul album or a way of life you should have outgrown. I was reminded more than once of Nick Hornby’s High Fidelity, another record store book, and it seems Telegraph Avenue will mine similar sonic inspirations – Chabon’s characters collect soul, jazz and funk from the late 60s and early 70s. 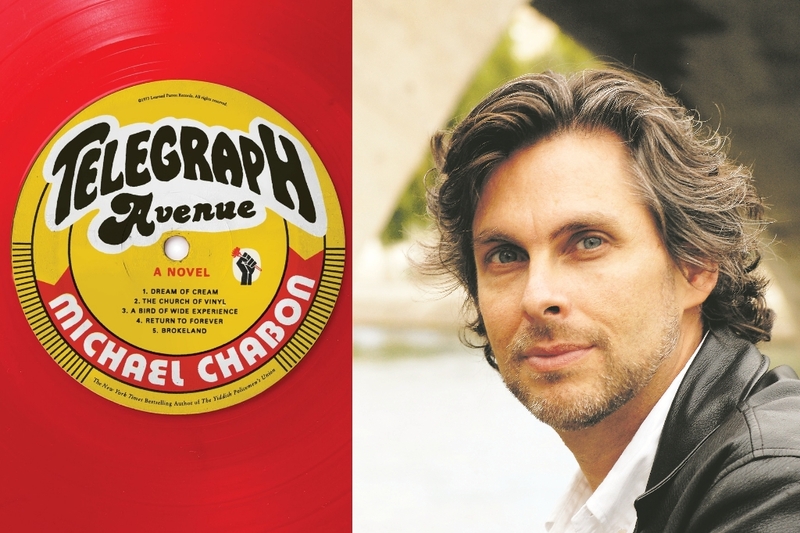 During the writing process Chabon was listening to the very music he was writing about, though he said he only began writing to music when he worked out it was the only way he could work on an airplane. Now I listen on vinyl. Because you have to get up every twenty minutes and turn the record over, or put a new record on, and that’s what you’re supposed to do anyway if you’re sitting in your chair for long periods of time. And I recommend buying vinyl records and a turntable as a cure for repetitive stress injury. Hey, it’s cheaper than a therapist. It’s very easy, not just with history but with factual information of all kinds to get hung up on sticking to the facts. So you have to give yourself licence, because you have licence. It’s silly to deny yourself the freedom that is one of the reasons for writing fiction and non-fiction in the first place. I hate having to stick to the facts. I set out trying to get it right and that was a daunting task. Since not only have I never done it, but I have no hope of ever doing it. It’s not like riding a zeppelin, which I also describe in this book and which I also haven’t done myself. But I could have done it if I wanted to, it just would have cost me $500 dollars I didn’t want to spend, so I figured I could just make it up. I can sum it up with one word. Neglect. That’s my secret. If you haven’t tried it, I recommend it. *photograph of Michael Chabon from Getty Images.